AAA Communications provides wireless communication solutions to some of the largest touring acts in the world. We also work with TV networks and movie studios. We provide complete communications solutions for your production team. We offer thorough, customized, end-to-end solutions to make your job easier before and after the sale. Browse our solutions by your industry to meet the unique demands of your business. The ability to communicate instantly is imperative in the construction industry. You know the challenges. You need to maximize productivity to stay competitive. But it can be difficult. Real-world job sites bring hard knocks, dust, dirt, water, hazardous materials and temperature extremes - and plenty of noise. Safety is essential and you need the fastest, most effective response if there's an incident. Versatile and powerful, Motorola two-way radios can help you respond to those challenges by helping you increase efficiency, safety and work crew productivity. Keeping your work crews in touch with instant communications and no monthly service fees, Motorola two-way radios minimize downtime and lower costs. Emergency features enhance worker safety. Noise-canceling features deliver crystal-clear audio, even in the noisiest environment. Intrinsically safe design allows communications in locations where flammable gas and combustible dust may be present. And better battery technology extends battery life throughout long shifts. When you need to communicate quickly and easily with all school personnel, the best way is over two-way radio. With the touch of a button, you securely link multiple teams across the district. Our next-generation solutions ensure staff can respond rapidly and work efficiently wherever they go. With durable devices and school-specific systems, you’ll have technology that connects directly to your needs. Increase safety and security of students and staff. According to the 2012 U.S. Census, 80 percent of schools expect a violent incident to erupt on their grounds. Educators agree that creating a safe, secure environment is their top priority. These are the facts on the ground, and you are faced with how to gain greater safety with fewer dollars. Next-generation communication solutions instantly connect staff and public safety when emergencies occur. You can keep track of children on the move, monitor buses and routes in real time, and link districts and staff efficiently on one device. Smart fire and first response for the moments that matter. When every second counts, you need to be able to share information seamlessly across multiple response teams, regardless of the device or network. 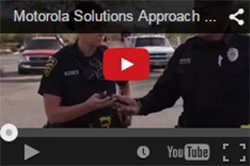 Motorola Solutions empowers fire services to better serve and protect lives through reliable communications and by turning data into actionable intelligence. When healthcare facilities are safe and efficient, staff can excel. Create an environment that is safe and secure, where staff can perform at their best. Manage incidents and emergencies and prevent security breaches from happening. Provide a high-quality experience for patients and visitors with well-run facilities. Real-time communications can strengthen safety, elevate service and improve overall efficiency. Elevate guest experiences with seamless communications. Nothing speaks to improving efficiency and guest service like next-generation communication solutions adapted to your needs. Big chain or small boutique, business traveler or tourist, consumers have abundant options on where to spend their dollars. Differentiating your property through exceptional service is one of the best ways to attract and retain them. Guests want to be delighted and feel comfortable in a safe and welcoming environment. They expect their requests to be quickly addressed. Hotels and resorts have numerous needs too. They must keep accurate track of rooms, supplies and facilities. They must also ensure security with instant, discreet communications and provide safety throughout the property. Increase contextual awareness, accelerate responsiveness, improve decision-making and make your city safer. Every time you exit your vehicle, enter a building, knock on a door or engage with a citizen, you enter the unknown. You don’t know who or what you are dealing with. Your safety and the community you serve are your first priorities. Law Enforcement requires real-time information for better situational awareness and more informed decisions in the field and at the command center. Mission-critical intelligence gives law enforcement the power to access information, stream video and collaborate in real time. By integrating unparalleled voice communications, immersive data applications and robust security into purpose-built systems, devices and command centers, we help dispatchers and responders work safer and smarter to improve real-time decision-making capabilities. Close the gap in your operational efficiencies with seamless communications. Smart Manufacturing and the Industrial Internet of Things (IIoT) are automating labor-intensive processes and driving efficiency, but they are still only as good as the people who use them. Connect all workers and devices with voice and data and expedite communications between machines and people automatically to keep your operations running smoothly. Our intelligent communication solutions are used by manufacturers all over the world to seamlessly collaborate, run efficiently and rapidly respond to whatever may occur. Achieve greater safety, intelligent production and asset security. In our energy-hungry world, the need for oil is at an all-time high. Global consumption is up, with oil and gas comprising 57 percent of resources used. Finding new oil is getting more expensive and involves extreme exploration. How can you meet the challenge safely while still staying competitive? By using next-generation communication solutions, you can bridge the gap between supply and demand, and enable better decision-making for greater safety and productivity. Elevate the customer experience with seamless communications. Create a positive shopping experience for your customers with well informed and coordinated staff. Improve communications between store associates and managers to create real-time flow of information and turn shoppers into loyal brand advocates. Extend the benefits of real-time communications into your warehouse and distribution centers creating an efficient operation that delivers the highest level of customer satisfaction. Ensure the smooth flow of finished goods into the hands of your customers with access to real-time data and always-on communications. Move people and cargo safely and efficiently with seamless communications. Your customers expect everything delivered when and where they want it. Meeting those expectations calls for reliable, clear voice and data communications, extending from the warehouse to the point of delivery. Drivers who can communicate safely without distraction. Assets that are tracked to maintain an efficient operation. We offer instant, reliable communications to help your delivery and logistics businesses streamline operations, control costs and delight customers. Utilities face a complex balancing act. You must meet growing consumer demand, comply with regulatory requirements, while simultaneously controlling costs. How can you be more responsive to customers, prepare for emergencies and disasters, keep track of assets and ensure safety isn’t compromised? Next-generation communications adapted for your needs can help your operation respond rapidly, manage assets efficiently and ensure safety is a constant – in the field, at the plant, for the community.